Achieving a lush landscape does not come as a stroke of luck. Often, it entails thoughtful design and ample investments of time, effort and money. 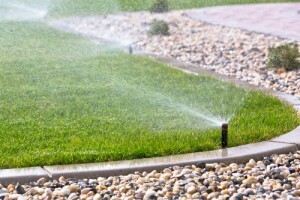 One of the key components of achieving your desired landscape for your residential or commercial property is irrigation — something that many property owners have difficulty getting right. One of the errors property owners make is overwatering, which in turn can lead to waste of water and the poor health of the turf and other plants. Through the use of an automated sprinkler system, property owners can avoid committing these common mistakes while allowing them to enjoy several benefits. What are the benefits of having an automated sprinkler system installed on a property? Property professionals acknowledge the immense benefits of a beautiful lawn, specifically in increasing the appeal and value of a property. Investing in an automated irrigation system can help further increase a property’s value while allowing the property owner to save time, effort and money over the long term. A properly installed sprinkler system that is tailored to the unique conditions in a location, as well as to the needs of the property owner, can greatly contribute to increased sequestration of carbon, noise reduction, dust control, and heat and water retention. Don’t let the acquisition cost of an automated sprinkler system discourage you from making this wise investment. Over the long term, the system will pay for itself through savings in water bills as well as its efficiency. Properly installed, such a system can help you efficiently use water while achieving optimal growth and health for your landscape. An automated system can help save water consumption by as much as 50 percent. Typically, the waste of this precious resource stems from water runoff and evaporation — problems that can be easily avoided with a properly installed irrigation system. Automated sprinkler systems can be programmed to run only at predetermined moisture levels or days/times, such as in the morning or at night, which can facilitate the efficient use of water while eliminating all of the effort on the part of the property owner. Finally, these sprinkler systems can encourage the optimal growth of lawns, crops and flowering plants while discouraging the growth of weeds. However, in order to reap these benefits, it is crucial to understand that the installation of these systems is best left to the experts. Specialists in the installation of sprinkler systems will help you tailor the best system by accounting for several factors that an ordinary property owner may miss. Call Jungle Busters for an expert appraisal on how an automated irrigation system can benefit your property.